When babies are born, they undergo a series of tests that help their doctors determine if they can see, hear, and use their other senses normally. When babies fail to turn their heads at the sound of people talking or music playing, their doctors may then recommend that their parents start sensory treatment that can help these infants regain their hearing or learn to live with hearing loss. Many babies who undergo therapy for hearing loss are exposed to music and musical toys at an early age. While many people fail to appreciate music’s role in treating deaf children, they may be surprised to learn how crucial music is when it comes to diagnosing and rehabilitating deaf children or children who have significant hearing loss. Many parents buy musical mobiles and toys for their babies’ cribs. While most babies react to the music and calm down when music is played for them, deaf babies fail to react to this sensory stimulation. In this regards, music plays a crucial role in these babies being diagnosed with deafness or hearing loss. 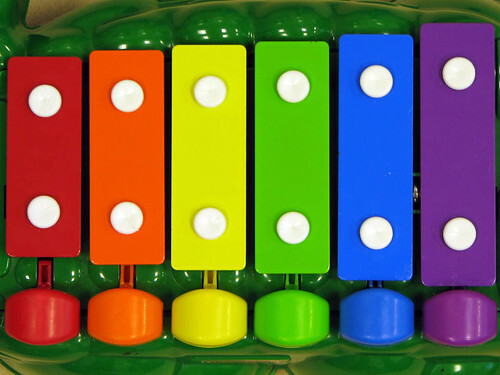 Pediatricians may confirm these results by using toys that play music. Examples of appropriate musical toys are found at . If a baby does not react to the musical toy, his or her doctor can then recommend further treatment. Many people question why therapists would use music during therapy sessions with deaf children. If a child cannot hear the music, why would his or her therapist include music in the session? In fact, scientists have suggested that music is both heard and felt. Indeed, people feel music when it is played. They can sense the vibrations and pitch changes. Thus, even though a deaf child may not be able to hear the melody being played, he or she can still sense the beat and musical fluctuations. This sensory stimulation can come into play as a therapist teaches a deaf child how to speak using vocal intonations or sign language. It also can be used for children who have cochlear implants and are learning to speak. They can refer to the music to learn about inflection and tone. Therapists who work with deaf children often remark that music is indeed a universal language shared by everyone. When children are allowed to shake tambourines, ring bells, play on xylophones, beat drums, strum guitars, and play other musical instruments, they share in an experience that transcends physical limitations. Even if they cannot hear what they are playing, they can appreciate that the sounds they are making are enjoyed by others. They can sense the music and dance along to the beat of the songs being played. Their playing and dancing lets them engage with others who have the ability to hear. Music in this sense is used as a way for deaf children to make friends and learn to gauge the reactions of others. It is a crucial part for their social development. Music has an important role in the treatment and rehabilitation of deaf infants and children. Therapists use music to encourage social development and teach crucial cognitive skills that will allow deaf children to succeed in life. Debbie Nguyen is a designer and blogger in the Atlanta area. Music therapy was an important part of her premature baby’s early development.